The proposal would provide a $10,369 annual tax cut on average to taxpayers in the top 1 percent of the income spectrum, who made more than $335,000 in 2012. The bottom fifth of taxpayers, making less than $18,000 a year, would see an average increase of $63. Those in the middle fifth, making between $33,000 and $51,000 in 2012, would come out about even, averaging an annual tax increase of $8. Even after other tax cuts for the top income earners didn’t grow the economy, Kasich is going back to the voodoo well here in Ohio. I mean its gotta work once sometime right?? He is moving Ohio from an progressive tax (on income) to a regressive tax (sales and service) tax structure which hurts the poor and low income people who are affected more by sales taxes than wealthier people. In other words, let’s move from a progressive tax policy to a regressive consumption tax. 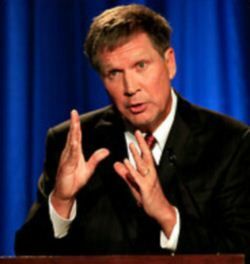 Noticeably absent from Kasich’s talk about taxes was his campaign promise to enact a plan to repeal Ohio’s income tax, which is a good thing. The first component of the reform is a 20% across the board income tax cuts, and a sales tax with a .5% cut but a massive expansion of items subject to the sales tax. In 2005, Governor Bob Taft proposed tax cut reform that required a a 21% income cut and a broader based sales tax that his budget expert confidentially predicted would lead to massive job creation in the State. 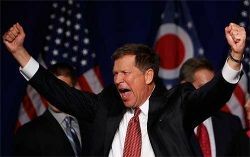 As the article points out the 2005 tax “reform” didn’t work but here Kasich wants to try it again. Plunderbund also has a good article pointing out the Governor raiding the Local Government Fund like he did in his last budget. It led to reduced services in many communities and new local tax requests to make up for the lost state funding. Like all good Republicans, Kasich wants to be able to say he cut taxes but from the increase in sales taxes and the new or higher local taxes, but what he actually gives is a big shell game. For a party that complains about redistribution of wealth they sure don’t mind taking from the poor and giving to the rich.